Many business processes involve file exchanges. Bid and proposal submissions, loan applications, legal filings, financial reporting, data backup and recovery, supply chain integration, B2B collaboration, and several business transactions all require the movement of files. 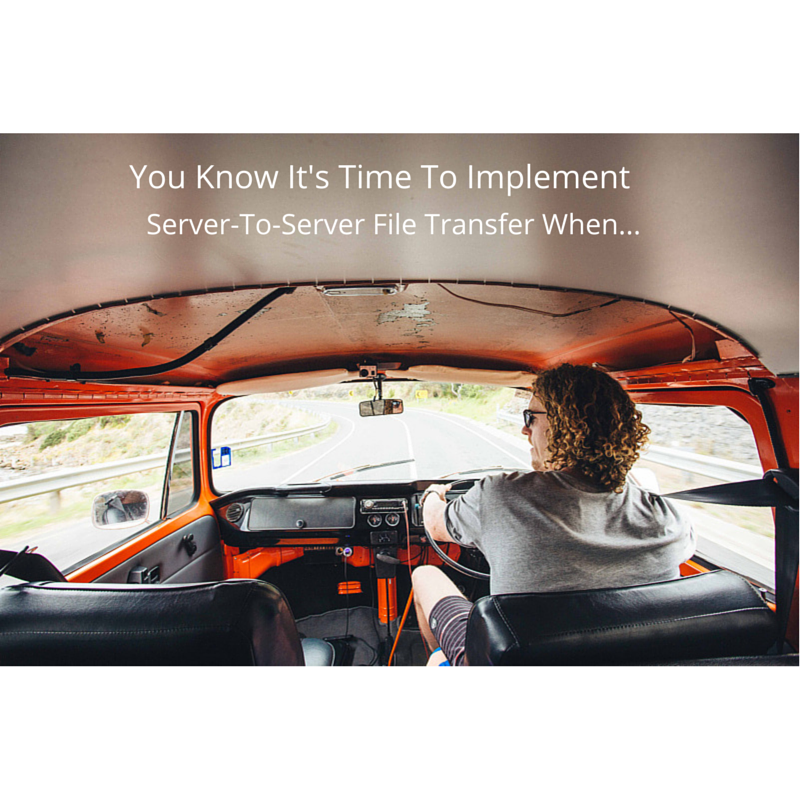 Although ad hoc file transfers usually get the job done, there are really situations that require server to server file transfers. Those particular situations are the focus of our discussion today. A server to server file transfer is the automated movement of data or files (we’ll be using these two terms interchangeably) from one machine to another. In other words, this kind of file transfer involves very little human intervention. Because of this, a server to server file transfer is generally much faster, more efficient, more accurate, and less prone to errors than a file transfer with more human involvement. A server to server file transfer doesn’t normally function on its own. Rather, it is usually implemented as part of a business process automation project. This requires system integration, wherein business, operations, or accounting systems are connected to the file transfer server. Since it is usually part of a business process automation project, a server to server file transfer system is generally more expensive to set up than other file transfer implementations (i.e., a server configured for only person-to-server file transfers). However, once the system is up and running, significant reductions in man-hours, human errors, paper consumption, delivery time, and several overhead costs can be immediately realized. There’s probably no better reason for implementing a server to server file transfer than when you have a bunch of companies with whom you frequently exchange data. Once you consider all the benefits mentioned earlier (i.e., reductions in human errors, delivery time, etc.) and combine that with the volume of transactions you have to make, you can easily justify investment for a server to server file transfer not only to your board of directors but to your trading partners as well. Advanced managed file transfer servers have features that are built precisely for this type of scenario. These servers, for example, allow you to add trading partners and then assign automated file transfer tasks (known as triggers) to them. To learn more about trading partners and triggers, click that link and watch our 2-part video on the subject. Manual, ad hoc file transfers are good for spontaneous, non-repetitive file sharing activities. But for transactions that need to be carried out over and over again - say on a daily, weekly, or monthly basis - then it would certainly be a good idea to automate things. Automation can ensure that transaction documents and other time-sensitive deliverables are always transmitted on time. This can be done by using a trigger that automatically prompts the server to execute a file transfer based on a pre-set schedule. Transactions that involve business-critical data need to be carried out in a timely, efficient, and highly accurate manner. Hence, these types of transactions aren’t suitable for ad-hoc file transfers, which can easily be subjected to oversights, data entry errors or even exposed to fraudulent acts. A computer to computer file transfer would be a better fit, being less prone to such risks. To avoid getting inundated with their daily deluge of data, many large enterprises who deal with several trading partners are forced to embark on business process automation initiatives like EDI (electronic data interchange), which rely heavily on server to server exchanges. These enterprises then require their trading partners to implement a compatible EDI system before transacting with them. Thus, if you need to transact with a large trading partner with this kind of requirement, then you might have no choice but to implement a server to server file transfer. Some of the transaction documents that are usually transmitted via EDI include purchase orders, invoices, advance ship notices (ASN), bills of lading, and student transcripts. Similarly, if you are a large company yourself and have a growing number of trading partners, then it would be a good idea to implement an EDI system and require your trading partners to adopt to it. That way, it would be easier for you to manage the various transactions that may come your way. Some industries are regulated by laws that call for secure, standardized electronic transactions. The Healthcare Industry’s HIPAA (Health Insurance Portability and Accountability Act), for instance, requires covered entities who engage in electronic transactions to comply with the EDI Rule and the Security Rule. These rules basically encourage the use of EDI and require those who do to implement standards for secure file transfers. Managed file transfer servers that support server to server file transfers already have a host of built-in security features, enabling them to facilitate regulatory compliance. The best way to implement server to server file transfers is through a pair of managed file transfer servers. A managed file transfer server would have all the necessary attributes for carrying out secure, fast, efficient, accurate and automated server to server file transfers. If you want to perform EDI transactions, then we suggest you pick a server that supports AS2. JSCAPE MFT Server is a platform-independent managed file transfer server that currently includes installers for Windows, Mac OS X, Linux, Solaris and UNIX platforms. JSCAPE MFT Server supports a number of secure file transfer protocols, including AS2. Download a free fully-functional evaluation today.